Hello Darlings, I am thrilled to introduce a Dinner Date giveaway! Not reserved for just couples, it is an evening of culinary indulgence at Spice Route — 499 King Street West, Toronto — to spend with the person you love. Perhaps you’re in need of romance, perhaps an evening of gossip with a best friend, or some quality time with your mother. I just hope that this giveaway makes someone’s day a little brighter! 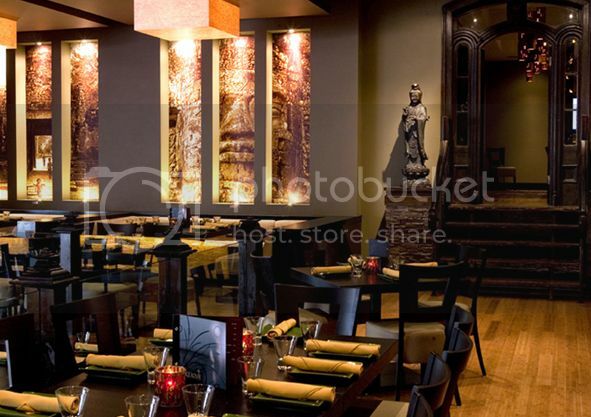 Courtesy of Liberty Group, one lucky winner will receive a dinner date at the Asian Bistro Bar, Spice Route. For you chance to win, just tell me who’s going to be your plus one for the evening? As for my own Spice Route dinner date, I enjoyed a relaxing evening with E. With a soothing candle lit atmosphere, eclectic Asian décor and tranquil patio; Spice Route has a fun yet romantic setting with authentic Asian cuisine by executive chef, Winlai Wong. With a large menu of about fifty dishes made fresh in the kitchen, we sampled about ten of them! Our tasting adventures began with Wong’s signature Wasabi Crusted Shrimp and thinly sliced New York strip steak cooked on a hot rock. We then ventured into Cantonese Chow Main — my favourite Asian dish — Crispy Orange Beef, and Braised Mushroom and Snow Peas. All of the dishes were amazing. Although Crispy Orange Beef was too spicy for me, E loved it. Our dinner was complete with Cème Brule and Fried Banana. All of the portions are generously sized and are meant to be shared. Every Thursday Spice Route has Happy Buddha with $4 drinks and $5 martinis. Every Sunday is Lundin, where for $24 you receive an all you can eat feast. * Please Note: Open to everyone. The contest closes at 3:00pm Eastern Time on April 27, 2012. A winner will be chosen by a random number generator.